Campo Sheet Metal offers high quality structural metal rolling to Texas and the Gulf Coast region while providing competitive pricing and lead times. CSMW can roll a vast selection of structural members including, but not limited to: angle, flat bar, square bar, tee, pipe, I-beam and W-Flange. Components can be rolled as arcs or complete rings. 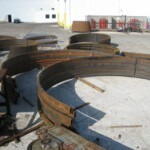 CSMW also has the ability to roll hand rails for spiral stairs as well as standalone coils and spirals. 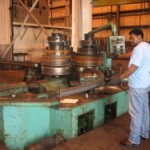 CSMW utilizes 4 structural rolling machines in our facilities with an expansive range of capabilities. Please contact us for further information on structural rolling capacities and information. Please allow us to assist you in your structural rolling needs.